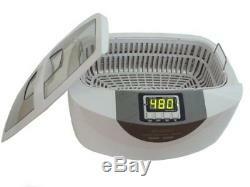 ISonic® Professional Grade Ultrasonic Cleaner P4820-WPB with Heater and Digital Timer, Plastic Basket. Digitial timer: 180, 280, 380, 480 and 90 seconds. Large tank size: 9.6"x5.9"x3. Tank capacity 2.6 Qt / 2.5 L. Power: 110V 160W including the heater. (220V available with extra charge) Ultrasonic frequency: 35,000 Hz. Come with a full size plastic basket. Warning: Do not use liquid bleach in the s. Professional grade ultrasonic cleaner with heater and digital controls. 2.6 Qt or 2.5 L tank capacity. Powerful industrial grade ultrasonic transducer. 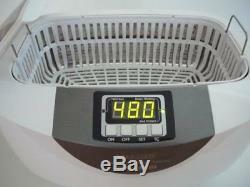 It can be used to clean jewelry, optical glasses, brass cases, automotive parts, etc. A full size plastic basket is included. Warning: Do not use corrosive solutions including liquid bleach such as Clorox in the stainless tank! It's corrosive towards stainless steel and will create pin holes quickly with an ultrasonic cleaner. Do not use corrosive solvents such as liquid bleaches in the tank or acetone over the housing. ALL ELECTRONIC ITEMS ARE 120V UNLESS OTHERWISE STATED. Order Cancellations - We are not always able to cancel orders regardless of when you request to cancel. Any product you return must be in the same condition you received it and in the original packaging. The item "ISonic Professional Grade Ultrasonic Cleaner P4820-WPB with Heater and Digit" is in sale since Tuesday, October 2, 2018. This item is in the category "Business & Industrial\Healthcare, Lab & Dental\Medical & Lab Equipment, Devices\Ultrasonic Cleaners". The seller is "slamavision" and is located in Multiple US Locations. This item can be shipped to United States, Canada, United Kingdom, Denmark, Romania, Slovakia, Bulgaria, Czech republic, Finland, Hungary, Latvia, Lithuania, Malta, Estonia, Australia, Greece, Portugal, Cyprus, Slovenia, Japan, Sweden, South Korea, Indonesia, Taiwan, South africa, Belgium, France, Hong Kong, Ireland, Netherlands, Poland, Spain, Italy, Germany, Austria, Israel, Mexico, New Zealand, Philippines, Singapore, Switzerland, Norway, Saudi arabia, Ukraine, United arab emirates, Qatar, Bahrain, Croatia, Malaysia, Chile, Colombia, Costa rica, Dominican republic, Panama, Trinidad and tobago, Guatemala, El salvador, Honduras, Jamaica, Antigua and barbuda, Aruba, Belize, Dominica, Grenada, Saint kitts and nevis, Saint lucia, Montserrat, Turks and caicos islands, Barbados, Bangladesh, Bermuda, Brunei darussalam, Bolivia, Ecuador, French guiana, Guernsey, Gibraltar, Guadeloupe, Iceland, Jersey, Jordan, Cambodia, Cayman islands, Liechtenstein, Sri lanka, Luxembourg, Monaco, Macao, Martinique, Maldives, Nicaragua, Oman, Peru, Pakistan, Paraguay, Reunion.